The welded, hermetic design of the 29PS provides increased reliability and maintenance-free operation for the lifetime of the switch. The actuation and release pressures of the disc are factory calibrated, simplifying installation and making the 29PS tamper resistant. The epoxy potting and rubber boot provide an environmental seal for the switch mechanism, protecting it from dust, oil and moisture. The 29PS is built into a vibration resistant package. Its compact size coupled with a wide variety of threaded and brazed pressure connections allows the 29PS to be mounted wherever is most appropriate for the appli- cation; inside a control box or out in the elements. Panel-mounted devices are typi- cally provided with capillary tubes to allow for convenient access to the reset button. A variety of line-mounted fittings are avail- able to simplify installation. Many different lead termination options are available for maximum flexibility. The Model 29PS pressure switch is primarily applied as an upper limit control on unitary and central air conditioning systems, heat pumps, roof top units, and refrigeration systems. 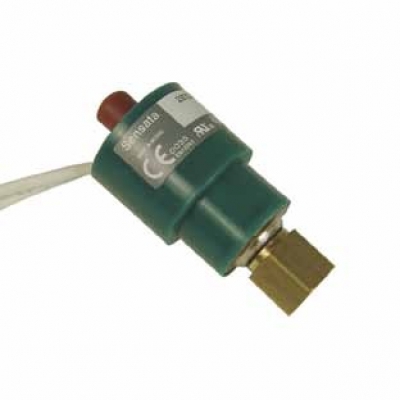 This hermetic pressure switch employs a trip-free manual reset function, providing high reliability in an environmentally sealed, low-cost package. The 29PS utilizes a snap-acting stainless steel Klixon® disc that reverses its curvature when pressurized above a customer specified actua- tion pressure. When the disc snaps, it opens a set of electrical contacts by means of a transfer pin. Resetting of the switch must be accomplished manually by pressing the inte- grated reset button. The unique latching mechanism in the 29PS design assures safe electrical cutout even if the reset button is held firmly depressed. This “trip-free” design prevents the consum- er from restarting the equipment until the line pressure has dropped below the release setpoint. Without this “trip-free” mecha- nism, the equipment could be restarted by simply holding the reset button in the depressed position, while an overpressure condition remains. Application Air conditioning, compressors, pumps, etc.